August is a time when giants roam the earth, giant caterpillars that is. Here's an example of one found in August 2011 (top), and the stunning Pandora sphinx moth it became this summer (bottom). In mid-August last year, I found a very large green caterpillar sauntering down a country road. 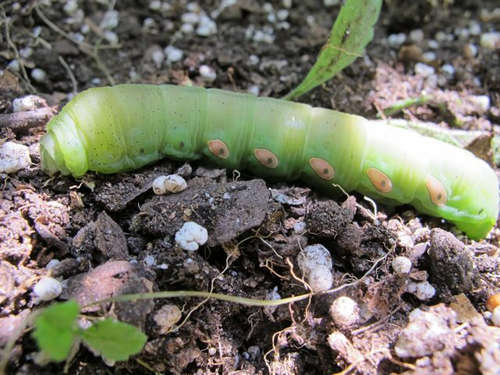 At roughly four inches long, it looked to be a sphinx moth (Sphingidae family) larva in the "wandering stage" typical of many caterpillars just prior to pupating. So I brought it the short distance to my home to get a better look at it and to try to overwinter it. Most of these very large caterpillars burrow into the ground to pupate, so I provided it with some soil and the right mix of resources and it dug in. Fast-forward 10.5 months to July 1st, 2012. I had nearly given up hope on the emergence of the moth from the chrysalis  a.k.a. the "eclosion"  but it finally happened! 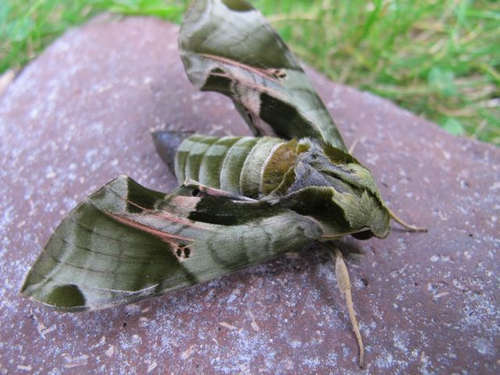 We became the proud parents, so to speak, of a Pandora sphinx moth (Eumorpha pandora), a stunning, velvety, forest green moth with delicate pink highlights. Considering the abundance of the sphinx moth caterpillars primary foods  wild grape and Virginia creeper  it is odd that the moth is not well documented in Minnesota. According to local expert Ron Huber, there are only about 8 records from the metro, and 16 statewide. There are many other large moth species whose giant larva can also be found this time of year. Identification can be challenging but fun. Poking through internet photos is a good start, and if you can pick up a field guide, I recommend David Wagner's "Caterpillars of Eastern North America."